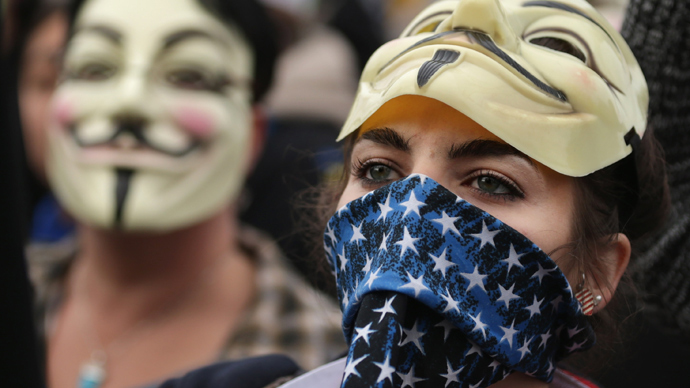 Can the Million Mask March turn a vendetta into a victory? As a general rule, state-run and corporate mainstream media networks will only allocate coverage to certain demonstrations, namely those that are aligned with either state-sanctioned political parties or advocacy groups. Anything else outside of that is normally swept under the control desk. The amnesty-immigration rally that took place on the National Mall in Washington DC during the government shutdown was given prime time by the media because it promoted a political party agenda. This is the globalist, corporatist way of keeping control over “consensus reality” as regarding dissident movements. In other word: if it’s not on the BBC, or CNN, then it didn’t really happen. That old stratagem of control is becoming less and less effective as word of mouth has also become globalized. 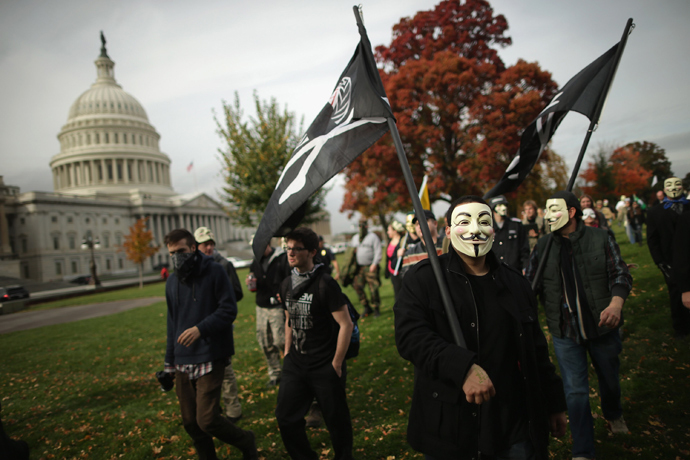 Despite the media blackout, this one was still hard to miss – an international Million Mask March organized by demonstrators around the globe and fronted by the hackivist confab known as Anonymous. 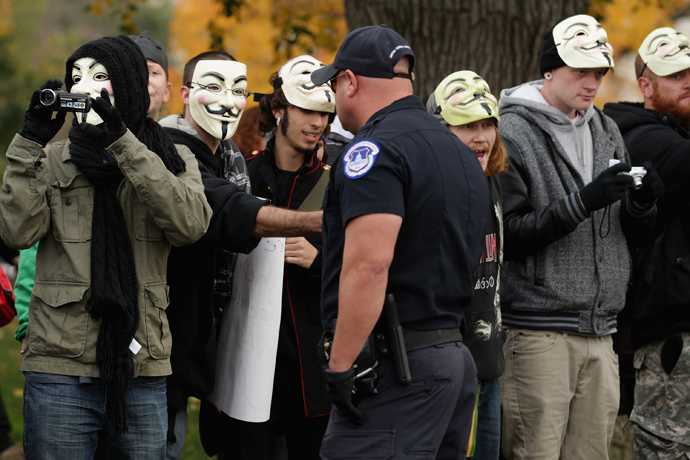 The million masks they are referring to are that of the Guy Fawkes caricature made hugely famous by the blockbuster film, “V for Vendetta,” which was adopted as the public face of hacker group Anonymous. Marches took place at 450 locations in cities all over the world. Different regional groups had various, long lists of grievances, but you could boil it down to systemic corruption throughout government and censorship in the media – all for the benefit of corporations. It’s hard to argue that this isn’t the case everywhere. Sparse mainstream media coverage of one of the largest events, in central London, was almost exclusively fashioned around celebrity personalities in attendance, like Russell Brand, who could be seen tweeting from Trafalgar Square, and who, amidst all the Guy Fawkes masks and black balaclavas – provided a recognizable anchor for media photographers and journalists. At first, I was skeptical of this march for a number of reasons, not least of all because of the opaque nature of this version of civil disobedience – hiding behind a mask. Beyond the Hollywood references, what does it really mean? This is perhaps the most profound – but not the most surprising aspect, of our brave new post-Snowden world, where a very significant social trend is defined by a disguise. It’s the idea that surveillance has become so pervasive that dissenters no longer wish to show their faces whilst protesting in public or in their parallel world online. Question: doesn’t this approach actually empower the state in the long run? Where Hollywood forges a new reality, the real world tends to bend it back into place. Besides the obvious theatrical benefits, in the movie “V for Vendetta” the masked march was vindicated because the objective was achieved – parliament was successfully blown up, and the corrupt head of state and inner circle of corrupt politicians exposed and brought to justice. The scenes in London and Washington DC didn’t have as desirable an ending as maybe fans of the film might prefer. British police could be seen in their usual show of force – storm troopers bullying crowds, cherry-picking young males and bundling them into the back of police vans, and then driving onto the sidewalk with lights and sirens blaring. Crowds eventually dispersed and returned home. In 2013, the 99 percent are still heavily reliant on the 1 percent for most things, from their smart phones to their symbology, and even for their counterculture. Why can’t the 99 percent fashion their own symbols and market the kind of iconography which Hollywood managed with the Guy Fawkes mask? No doubt, a few media executives and shareholders are snickering at this unique situation. To get a better understanding of the Million Mask March, I decided to spend a few hours riding shotgun via the internet. I joined their DC march around 4pm EST just before dusk on the East Coast from my remote viewing location in London via a Live Stream link, courtesy of one demonstrator known as “Jason From The Internet.” The demonstration had split into two or three main groups; I was following the group heading toward the White House. For anyone who hasn’t yet followed a live event through an independent video stream, you are missing what is probably the purist experience in live media – all the sights and sounds of a live event, with essential commentary, and no commercial breaks. Video operator Jason was well prepared for the long DC march with his GoPro camera and a backpack full of extra batteries to power his camera and phone for the duration of the live link. Jason was what every media ground correspondent should be, but so often isn’t – accessible, down to earth, and friendly. Things got more interesting as the column marched towards the US Federal Reserve building, chanting,“End the Fed, end the Fed!” A small group stopped for a brief rally at the steps of the building. Up to this point, police had been mostly playing the role of shepherd, with some instigating and a few minor altercations. One masked marcher could be heard describing a brush with the police: “One cop kept asking us, ‘Who is the leader? We need to speak to him,” to which the protester replied, “There is no leader!” That exchange summed up how detached and out of touch law enforcement really is with what was going on that day. Police moved in swiftly to form a barrier between the White House lawn gates and the masked crowd. One police officer could be heard asking people, “Please move back.” The crowd responded in kind. Soon after, Jason ended his live stream transmission. The age of the globally-coordinated flash protest has arrived. In the last few months alone, a number of well-organized and highly intelligent global demonstrations have been staged to protest a range of issues, from western military intervention in Syria to the cartel activities of GMO giants such as Monsanto. In Britain, the anti-fracking protests and the rally against the privatization of the NHS outside of the Tory Party conference were also significant. Both delivered the numbers and their message, but were blanked by the mainstream media. 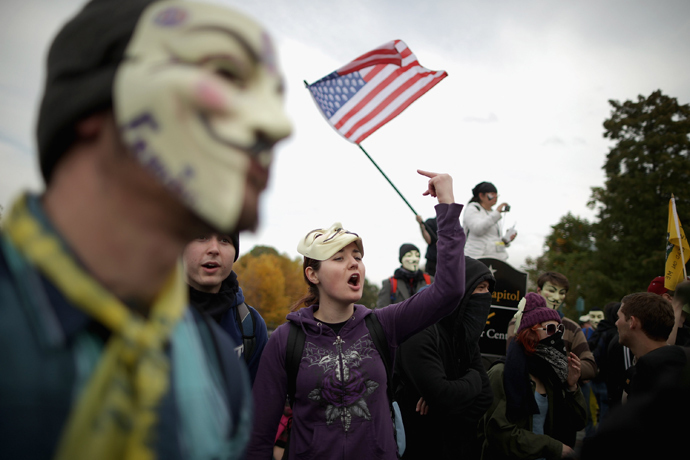 The Million Mask March delivered the numbers, but somehow the message got lost somewhere behind the mask. But what this group lacked in succinct communication and a packaged political message, they made up for in hard graft, commitment and determination. The level of mental and physical commitment should be applauded – 10 hours of continuous demonstrations and marching. Contrast this to the veterans’ march a few weeks earlier, where demonstrators were active and even dumped metal barriers at the White House gates, but only congregated for about three to four hours, before they dispersed and headed home. Aside from that, this DC march showed a level of independence, political realism and intelligence that cut right through the stale left versus right political paradigm. If systemic corruption in government and collusion with corporate raiders is going to be reformed, then we will certainly need crowds who can elevate the conversation to a higher level – like this crowd did on the Million Mask March in DC. This crowd was young, creative and energetic and used most of the tools available to them. They clearly have chosen this homogeneous mask as their means of self-expression, which may seem contradictory on the surface, but indicates a far deeper psychological argument. Everyone should pay attention, stop and ask why young people are reaching for the mask. It speaks volumes in terms of where social politics are for this generation. Now for the next challenge: How will they make their V move from just a Vendetta to a Victory? If you remember, at the end of the film, everyone took their masks off revealing a sea of individuals sharing similar values. In real political terms, that’s where the real power is.